Your progress from taking guitar lessons has very little to do with how much time you practice or how much natural talent you have. Your results depend mostly on your attitude, mindset and actions. The better your guitar teacher is, the faster you become the guitar player you want to be. Most guitar teachers have average (mediocre) teaching skills. Some teachers are pretty good… and a few are truly great. An average guitar teacher teaches you how to play things (scales, chords, songs, guitar solos and techniques). A good guitar teacher might also teach you how music works and how to apply what you know. A great guitar teacher teaches you how to learn. Solve your guitar playing challenges that are holding you back and keeping you stuck. Make faster progress in your guitar playing than you ever have before. Know what to practice to reach your musical goals easily and fast. Tie all your skills together, so you feel like a true musician and not just a guitar player. Enjoy the process of reaching your musical goals. A great guitar teacher can also help you make rapid progress in your playing after just a few minutes of practicing. To see an example of this, download this free eGuide with 5 easy tricks that make your guitar playing sound better in 10 minutes. Tip: Don’t assume that every great guitarist is a great (or even good) guitar teacher. There is a huge difference between playing guitar well and teaching another human being how to play guitar well. Most of the time these 2 skills are not related. Of course sometimes great guitar teachers are also great players, but one skill does not always imply the other. This is why it’s important to look at a guitar teacher’s students to understand how good the teacher actually is. The better of a guitar student you are, the faster you improve from taking guitar lessons. Commit to doing everything your guitar teacher tells you to do, both during your guitar lessons and at home. How you practice at home between lessons is the most important part of your progress. You don’t need to practice guitar for hours per day… but it’s important to practice something every day, with your full attention. The better you practice at home, the less time your teacher has to spend each lesson to review things you already learned. This saves you time and money. Commit to keeping an open mind. Sometimes your guitar teacher may tell you to practice in ways that push you outside of your comfort zone. Other times you may need to let go of old beliefs that have slowed down your progress in the past. You can become a good guitar student even if you haven't been one in the past. Read this article to learn how to become a good guitar student. Learn how to choose the a guitar teacher to and reach your goals. 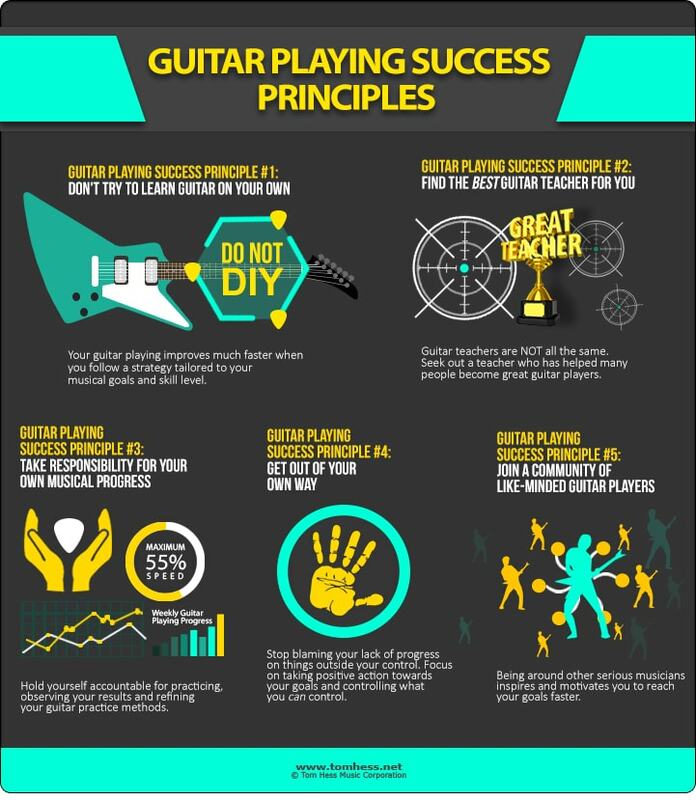 Learn 3 reasons why you are not getting results from guitar lessons. A great guitar teacher lays out a path towards your musical goals. To follow the path, it’s important to trust your guitar teacher fully. This means avoiding temptation to learn guitar from other sources and staying laser focused on the path your teacher created for you. The more you distract yourself, the slower your progress becomes and the more frustrated you feel with your guitar playing. This is one of many reasons why self-taught guitarists often struggle to make progress. They usually have no structure in their learning and most spend a lot of time practicing to get very little results. Note: if your current guitar teacher hasn’t earned your trust, find another teacher whom you trust more. Perseverance is the #1 key to success in anything and it makes or breaks you as a guitar player. You are going to face challenges in your guitar playing even with the best teacher guiding you. Choose to persevere for as long as it takes to get the results you want. The rewards are always worth the struggle. Your guitar teacher is there to help you make the learning process as effective and efficient as possible. When your guitar practice is effective, you get the results you want. When your guitar practice is efficient, it means you are reaching your goals as quickly as possible, without wasting any time. Want to make your guitar playing sound better in the next 10 minutes? Download this free guitar playing eGuide and learn 5 easy tricks that make you love the sound of your own guitar playing. Take online guitar lessons with a great guitar teacher.